BANGKOK - Thai shelters for Rohingya women and children desperately need more assistance to care for victims of a deepening trafficking crisis across Southeast Asia, activists said on Friday. A lack of Rohingya translators, in particular, puts traumatized women and children at risk of falling back into the hands of traffickers. Thousands of Muslim Rohingya have been fleeing persecution and poverty in Myanmar and Bangladesh, paying to be smuggled aboard rickety boats across Southeast Asia's waters to Malaysia. Criminal gangs control the mass migration, and the most common first stop is Thailand's southwestern coast. Here, many are held for ransom in secret camps, then granted onward passage or killed. In Thailand, those rescued by authorities are kept in immigration detention centers, while women and children are sent to shelters originally set up for victims of domestic violence. "These women and children have been through a terrible ordeal, from the dangerous and often exploitative journey, to family separation upon arrival," Vivian Tan, spokeswoman for the U.N. refugee agency UNHCR said by email. "Husbands, wives and children have been separated during the journey... It can add to the trauma not knowing what happened to their loved ones, and not knowing what the future holds." Those working in the shelters say they lack food, translators and psychologists to support the victims. "We need translators, most of all," Dararat Suthet, head of a shelter in Phang Nga province on the southern Thai coast, told the Thomson Reuters Foundation by phone. She said her staff struggled to convey simple, but crucial information such as how to flush toilets and prevent them from getting clogged. Shelters often rely on Rohingya people in the area who can speak Thai, "with the understanding they'll help, but in reality, they don't know who these people are," said Amy Smith, an executive director of Fortify Rights, a watchdog group tracking the plight of the Rohingya. Instead of helping, these translators may lure women back into trafficking rings with the promise of reuniting them with their husbands. "The Thai staff will be told, 'This woman is OK, she's going to the market, we'll help her shop,' and the next thing you know they're in the hands of the traffickers," Smith said. Since the discovery of mass graves at abandoned trafficking camps, Southeast Asian governments have hardened their stance on Rohingya Muslims. 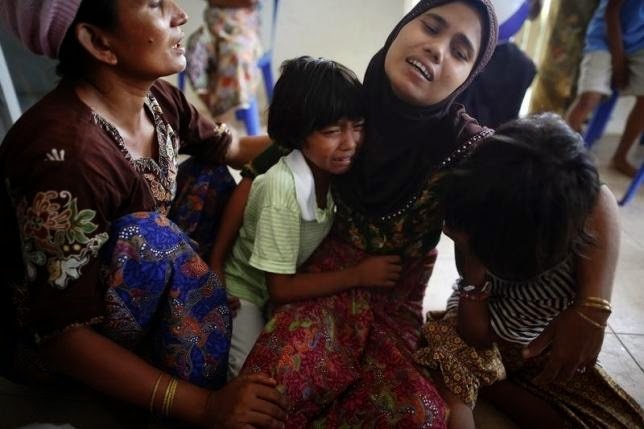 This week, Thai, Malaysian and Indonesian authorities turned away boatloads of migrants, leaving them stranded at sea. But thousands have already made it to shore. Dararat's shelter has assisted more than 100 Rohingya over the past two years and is currently housing 21. Staff from the International Organization for Migration (IOM) and UNHCR provide assistance, and 13 from the shelter have been resettled in the United States. UNHCR supports shelters through visits from teams that include "roving interpreters". It also provides counseling and submits the cases of the most vulnerable refugees to resettlement countries for consideration. A shelter in Songkhla province, which borders Malaysia, needs food assistance, such as rice, milk, snacks and eggs, said its head, Chomruedee Nakasiri. Normally women and children who arrive in the shelters stay for three months before being sent to another agency to assist them, but in Phang Nga, some have stayed for seven months. "They keep coming in. The immigration police look to shelters as the appropriate place for women and children," said Dararat. "About 20 more people are coming in today."